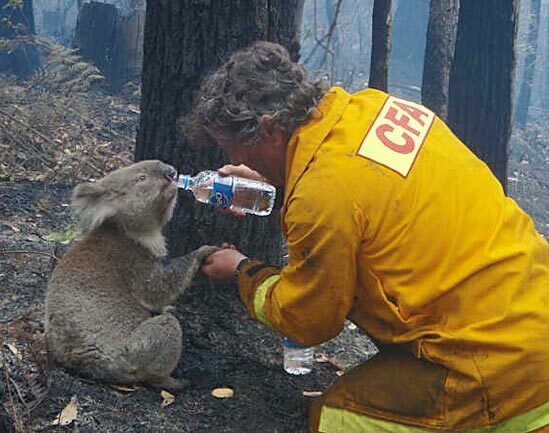 A testimony to the generosity and solidarity of Victorians in a crisis, millions of dollars are pouring in for human bush-fire victims, but the people rescuing animals are digging into their own pockets. We have enough to take care of everybody, man, woman and wildlife. Please direct some to the wildlife. It is very dangerous to go into the forests still, but people are already bringing out the native animals and someone has to take care of them and feed them. It has been reported to me that the rescuers are simply digging into their own pockets and that they are filling up their homes with injured creatures. These animal rescuers and nurses deserve full-time salaries from the government, as well as medals - all year round. Please show that you are not as stingy or pitiless as our government. You might think that the Department of Sustainability, which administers the Flora and Fauna Guarantee Act (never ever applied) and the Wildlife Act is taking care of things. Well I would like to know what they are doing for wildlife right now, apart from issuing dubious culling licences. It is we humans who caused the fires by thinning the forests over two centuries and letting in the light which dries them up. The forests control the climate. Without them the ground heats up and turns to desert where nothing grows. The forests need the animals and we need the forests. The forests CAN BE helped. We have to rehabilitate Victoria. That includes all Victorians - feathered, furred, finned and foliaged as well as human.